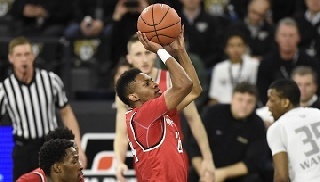 Rochester, Mich. -- The Youngstown State men's basketball team dropped a 101-72 decision to Oakland on Tuesday night at The Blacktop at O'Rena. Three Penguins reached double figures led by junior Cameron Morse's 15 points. Freshman Braun Hartfield scored 12 points while junior Francisco Santiago added 11 points. With the loss the Penguins fall to 11-19 overall and 5-12 in the Horizon League. Oakland improved to 22-7 overall and 12-4 in the league. Oakland's Jalen Hayes led the Golden Grizzlies with 24 points and 13 rebounds while Martez Walker had 19 points. Sherron Dorsey-Walker and Stevie Clark each had 12 points. Both teams started slow and the Golden Grizzlies scored the first six points of the game before the Penguins knotted the game at 6-6. The teams battled through three more ties before Oakland took a four-point lead, 21-17, at the 7:11 mark. YSU went on an 8-2 run sparked two free throws from Jorden Kaufman, an old-fashion three-point play by Brett Frantz and a 3-pointer from Hartfield to take its only lead of the game, 25-23, with 5:55 left in the first half. Oakland closed out the first half on a 19-6 run to take a 42-31 lead into the lockerroom at halftime. In the second half, the Golden Grizzles made 22-of-42 field-goal attempts, including four 3-pointers, and went 11-for-13 from the free-throw line. For the game, the Penguins shot 41.8 percent from the field, including 45.5 percent in the second half. Youngstown State closes out the regular season at Cleveland State, Saturday, Feb. 25, at 3:30 p.m.